Ambient 8C Measuring the heater valve was tricky as it tended to jump about a bit with the digital thermometer being close to HT leads, it seemed to average about 80C. I turned the engine off and measured again and it was 71 over the valve outlet, higher over the valve inlet. Ambient and cabin temperatures were measured with a digital cooker thermometer, engine compartment temperatures with a digital infra-red. Note that the laser spot on these is not the point at which the temperature is measured, that is taken over a much broader area. For small parts the gun must be placed right on the object. And in a GT don't forget that opening a 1/4-light or window a smidgen really helps the screen clearing, at least. I know that the MGB can't be compared to the Volkswagen Beetle for airtight-ness but with all the windows closed it is like asking the fan to blow up a balloon. But Roger Parker has said that you can get two cars where all the above are apparently as they should be, but there is still a noticeable difference in heater performance. That still leaves the cylinder head and water pump as possible variables - the cylinder head gained a larger port for the 1972 model year, and there were six different pumps. It can be quite confusing to work out just what is going on without dismantling as although the heater is clearly visible in the engine compartment all its workings are hidden away in the depths of the dashboard and the cars structure. 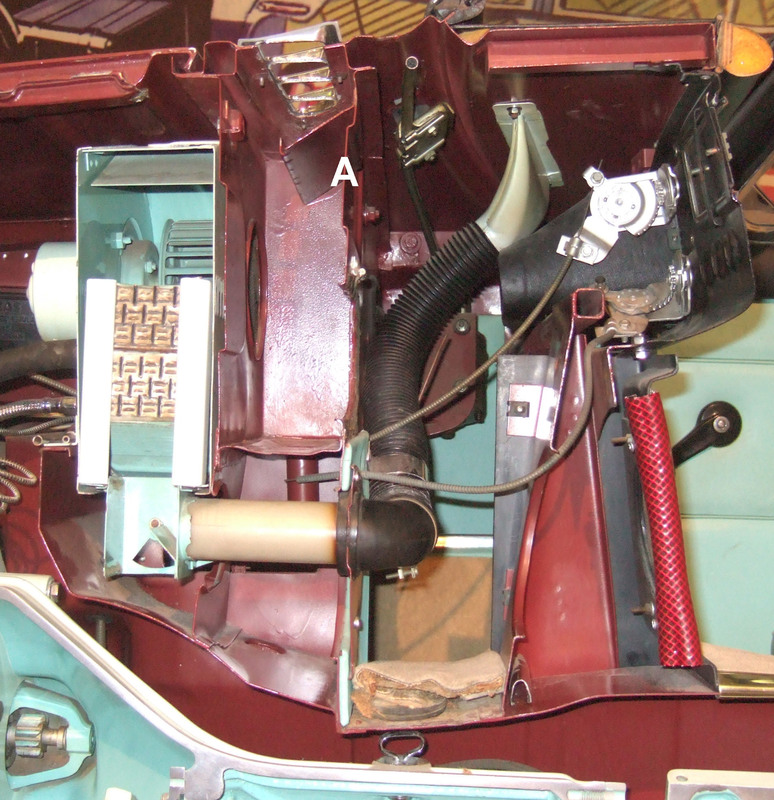 What you can see, when looking into the engine compartment from the front, is the back of the motor on the left, a hose connected to the tap on the cylinder head low down near the middle, and another hose at top right connected via a metal pipe to a spur from the bottom hose. Logically, and for the most efficient coolant flow, the inlet should be higher than the outlet so natural convection (the temperature of the coolant reduces as the heater transfers heat to the air) aids pumped flow, but in fact it is the reverse i.e. heated coolant comes out of the tap on the cylinder head, into the lower port of the heater, flows upwards through the matrix, and out of the top port to the bottom hose to be circulated through the engine again by the pump. As it would have been quite possible to put the motor on the other side and angle the matrix the other way i.e. a mirror image, so convection aided pumped flow instead of opposing it, I can only assume that they already had the heater unit available in the 'parts bin', quite possibly where the original application had the heat source and return on opposite sides of the engine to the B-series, and had to use that to keep costs down. 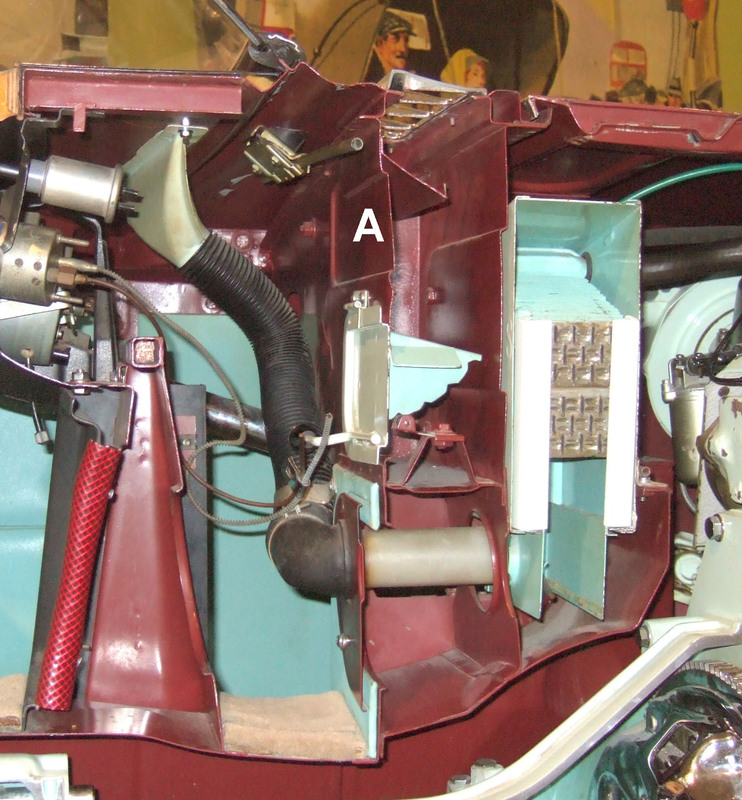 The back of the heater casing butts up against the front of the air-box at the base of the screen, there is a large circular hole connecting the two with the motor impeller sitting in the hole behind a mesh screen (except earlier cars) in the motor casing. Thus when travelling along air pressure at the base of the screen rams air into the heater unit, and when the motor is running the impeller pulls air in from the box. Air is blown downwards through the matrix picking up heat, towards the flap at the base of the unit that controls air distribution. A felt (ideally) or foam strip is wrapped round the ends and sides of the matrix preventing cold air bypassing the matrix, which is one of the several causes of poor heater performance (good air flow but cool), as is anything partially blocking the matrix (poor air flow). Air to the footwells comes out of a large opening at the bottom of the heater unit, on top of the tunnel, and then travels sideways to exit into the footwells, via plain moveable flaps on early cars and fixed hoods or cowls on later cars, both mounted on the sides of the tunnel. The later fixed cowls are better at directing heat down onto the feet, with the earlier moveable flaps a lot of air will escape sideways and not be directed downwards. Although with the individual closable flaps you could close the passenger one to get more air to the drivers footwell if you wanted. Air for the demisters comes out of two holes on the lower back of the heater unit, pointing towards the back of the car, various tubes and hoses taking this up to the demister vents on the dash. There is additional fresh-air (i.e. unheated) ventilation available from the cold-air flap on all models, and the dash vents on the 1972 and later model years. Some thoughts on heating/ventilation control by Michael Beswick: Yesterday I was out on the Gunpowder Plot run in Essex and Hertfordshire. It was a really good day, but needed a fairly early start when it was decidedly nippy! Roof down, sheepskin jacket, and so on, with the heater on "Interior" and Temp control on "Hot". After about half an hour (I am a bit slow) I commented to the Navigator that it was not that warm around my feet. She agreed and then I noticed the "Fresh air flap" was wide open. (We had been out another weekend and it was very warm so I had opened the flap). Later on it got quite warm, so the heater output needed reducing to nothing! Having had many heater valves fail over the years I have a plumbers ball valve type which regulates the water flow pretty well, so started wondering about the air flow. First thing was to shut the flap, and it got all toasty. It started me thinking about the air flow "controls" in addition to the direction knob for "defrost or interior". Most are fairly binary, but all affect the amount of warm air you get from whatever state your heater matrix is in. I have a couple of pieces of acetate under the grill in front of the windscreen. These can be adjusted to regulate the amount of air that actually enters the heater box. I have the two "Fresh air vents" on the dash: open and whatever goes in the grill comes out of the dash: closed the air flow heads into the heater box. Then the fresh air flap: whatever that entered the grill, was not expelled thru the dash vents can exit at your feet if the flap is open or not if it is closed. (I'm not sure the partially closed positions make all that much difference.) With the grill "half open", the dash vents and the cold air flap shut, it gets really very warm: the final "effect" can then be adjusted with the regular temperature control or by directing part of the air flow up the screen (It's a Roadster!). With the hood up in winter I have used the blower with the dash vents open and the grill closed off to recirculate the cabin air, but never tried adjusting the heating effect using the air controls. Which may just imply I'm a bit thick! I've had the car 15 years......tho it is primarily used in good weather! The Gaydon cutaway drawings show the air "route" well - right-hand side, and left-hand side, the letter 'A' showing where the dash vents are connected on the later models. This is the box under the external vent at the bottom of the screen. There is a drain hole at the bottom of the box which has a curiously shaped length of hose connected to it known as "Tom's Knob". It is visible from under the car near the front of the gearbox tunnel at the right hand side, and is a length of about 1" bore hose with a ball-shape at the bottom and a slit below that, secured to a short pipe on the bottom of the air box by a worm clip. The purpose of the ball and slit is to allow water to drain out but stop any engine fumes from being drawn up into the airbox and from there into the cabin. However over many years debris can build up in the bottom of the airbox, particularly if the car is parked under trees, and the vent can get blocked. Usually the first you know about this is that the carpets get wet from the airbox filling up with water and reaching the level of the vents into the cabin. Click on the thumbnails on the left for a larger image of where this drain can be found and cleared (Mike Howlett advises that this method can only be done on the 72 and later cars as on the earlier models the water deflector covers the drain). A length of 1/4" dowel (the drain hole is only about 1/2") is ideal for gently probing around the bottom until you find the hole then carefully working through the gunge in the pipe until it comes out of the bottom. That should release any trapped water which will probably be black and gungy, which is why it is always preferable to work from above and avoid getting a face-full or even an arm-full. Then slowly run clean water in from the top from a hose while you work the rod up and down to wash out the accumulated debris until the water runs clear. Some recommend cutting the ball off the end of the hose but since this is probably a once in 30 years or so operation there doesn't seem much point, and it does stop fumes getting into the cabin. If you do need to get at the drain hose for any reason it is fixed to the bottom of the heater box with a worm-clip, which when looking up from underneath seems impossible to get at. However on early cars with the adjustable footwell heater flaps the clip is behind the right-hand flap, and on later cars there is a blanking plug on the side of the tunnel in the right-hand footwell, immediately behind (relative to the front of the car) the heater outlet, giving access to this clip. Be aware that this area has probably never been touched since the car was first assembled, the clip may be rusted, and I have heard of at least one case where leaning on the clip to undo it caused the end of the spigot the hose attaches to, to break off. Incidentally, Pete Thompson has pointed out (January 2011) that the drain should never be left without some kind of hose being attached to it, as the spigot is inside a box section above the tunnel, and the drain hose comes through a hole in the tunnel. This can be seen from the two photos - the access hole for the clip securing the drain hose is level with the heater footwell outlet in one photo, which is clearly above the top of the tunnel in the other. Leaving the spigot without a drain hose will allow water and debris from the air-box to get into the cabin at best, or be trapped and rot out the tunnel at worst. (1) Increased access through driver's side by "Dremelling" out the existing access hole - I chose to make it the size of the big rubber bungs in the firewall, as I had a spare. (2) Removed the clamp from the top of the tube (my tube was sitting loose, having separated from the metal extension to which it was attached). (3) With the improved driver's side access, used a sharp blade to divide the tube into an upper section (about 1 1/2 inches) which comes away through the top access hole; and the lower section which comes away below the car. (5) Using a copper sleeve, joined the lower section of the original Drain Tube to the new heater hose tube, to preserve the function of the ball-and-split on the end - which I presume is to limit the passage of fumes up into the cabin. (6) Cleaned up old crud around the hole where the tube passes down to the open air; a bit of rust-converter for good measure; and then replace trim and look forward to a water-flow test at the weekend. I realise this is not rocket science, but I thought it might be of interest to someone looking at the same issue. Anyone who is about to refit a shiny new dash will be aware that it is folly to fit the dash without first ensuring that no water is entering via the fresh-air vent. Don't ask me how I know this. Kind regards, John. It could also be used as the top half when replacing a missing tube, as shorter versions with the same split ball end were used on later BL models. However after many years of being NLA an alternative design is now available. Originally secured with spire clips underneath the panel, these have to be prised off carefully to avoid damaging paint, and caught unless you want them to lie in the bottom of the box rusting away, or block the drain. These days there are plastic sockets that push in from above, which make the grille easier to remove ... for both you and a tea-leaf. However when first using these you may have to enlarge the holes slightly to get the sockets in, bear this in mind when sending the car away for painting, making sure the holes are big enough to begin with. When I repainted Bee 30 years ago I replaced this along with all the other bright trim, but knowing the quality of replacement parts these days it was the only part I replaced on Vee in 2017 as it was showing corrosion. But not unsurprisingly it doesn't fit very well having a different curvature, and I had to reuse four of the old spire clips as the plastic sockets would not hold it down. Bee's replacement fitted just fine, and having kept both old ones they and Bee's new one have the same manufacturers mark on the back and the same curvature. I can't compare that with Vee's new one as I'm unwilling to risk damaging the paint prising the spire clips off, but I have been able to compare the curvatures with a spirit level which does show the new one is way off. You can get a mesh screen that fits under the bright grille that is said to keep the drain clear, but unless you regularly park in the open near trees it's not worth it. I've only had to clear Bee's hose once in 30 years, shortly after getting her, and the PO did park outside. Also note that the smaller the mesh the more it will restrict air-flow though the heater and into the cabin. As far as fitting goes as above there were originally half-a-dozen spire clips pushed on from below, but these cannot be reused with a mesh as there is no access. This means you will have to use the plastic sockets, but given the incorrect curvature of replacement grilles how secure they will be is questionable. When fitting a mesh put it on the grill first over the pins trimming to size if necessary, then put the grill complete with mesh back on the car. This is controlled by one of the two knobs on the dashboard - the one that says 'Screen', 'Interior' and 'Off'. This moves a cable which controls an airflap at the bottom of the heater box inside the car to direct the air to either the screen vents, the footwell vents, or block it off altogether. Note that early cars had a door on the footwell vents and if this is closed it will block off the air no matter how the heat and direction controls are set. By removing the footwell vents and standing on your head in the footwell you should be able to see the air flap moving as the control is turned. If not maybe the cable has become detached from one end or the other. Removing and replacing the heater is reckoned to be the worst ever job on the MGB (but comprehensively described on this Chicagoland MG Club page) and refitting the direction control cable has to be done at a particular time. If yours doesn't work then maybe a PO got the heater box back in forgetting to refit the cable and couldn't face getting it out again. Another problem is that there should be felt strips glued to the flap and these can become detached blocking the airways. If the flap moves and the strips are in place but the air direction does not line up with the knob markings it could just be the relatively (!) simple job of adjusting the cable in the clamps on the dashboard control. But there were several sets of knobs and controls over the years if yours works backwards a PO may have fitted the wrong one. As well as different mechanisms for air and heat there are also different ones for RHD and LHD dash-mounted, 4-cylinder and V8, and for various export markets - no less than 11 different types, plus 10 different knobs, and whilst later models had common knobs there were 4 different dials that went behind them! The controls have two locating pegs that fit into holes on the dash, each control can fit in one of two positions 180 degrees apart, so check that the legends on the control knobs align correctly with the datum pip in the dash above each knob also. Convention seems to be that the heat control goes above (dash-mounted) or to the left (console-mounted) of the direction control, on UK dashes at least. This is probably quite important as you will see the flats and location holes in the dash are different between the two. When the controls were moved to the centre console they became the same for both RHD and LHD for obvious reasons, before that when on the dash - firstly on the right for the LHD tin dash, then either side of the column on the padded dash, they had to be different as the cables went off in different directions. The direction flap is situated in the large opening at the bottom of the heater unit, running across the car, pivoting horizontally. The ends of this can just about be seen and felt through the footwell vents. In the Off position the top half is tilted towards the back of the car so it covers the angled plates that direct air into the demister ports, so blocking those off, and the bottom half is tilted towards the front of the car, so blocking the footwell vents off as well. In the middle Interior position the flap is straight up and down. Both the interior and demister outlets are uncovered, but as there is more resistance to flow up to the screen the bulk of the air comes out of the footwell vents, although some comes out of the demister vents as well. On Demist the flap is tilted so that it completely blocks off the footwell exit, so all air is directed through the demister ports. Whilst airflow to the footwells comes direct from the heater box, that to the screen vents goes via flexible tubes coming off the back (i.e. the cabin side) of the air box high up behind the centre of the dash and going to the slotted vents under the screen. If footwell air is OK but little or nothing is getting to the screen, particularly one side only, check these tubes are in place and not split. Note that in November 1970 the screen vents were changed to include baffles that improved the distribution of air across the screen and hence demisting. Effectiveness of both the Off and Demist positions is aided by felt strips glued to the edges of the flap to give a good obstruction to airflow without rattling. These felt strips can come unglued which not only prevents complete closure from a missing strip, but the dislodged strip can block normal movement of the flap, and block airflow to both demister ports and footwell. With the heater out you can detach the air-direction channel from the main case which makes it easier to clean and replace the felt. Getting at the control can be a fiddle. First you have to remove the knob. Somewhere on the shaft of the knob you should see a hole or depression that looks like it might contain a grub-screw. It doesn't, it is a spring-loaded pin on the control shaft. Depressing it while pulling on the knob should get it off but some knobs have been known to seize on the control shaft. With the knob off remove the nut and withdraw (that all encompassing term) the control from the rear of the dashboard or console. The UK dash-mounted ones are much easier to remove than the console mounted in my experience, can't speak for the American padded dash. With the control in your hand you should see the outer of the cable is clamped to a fixed arm by a curved bracket secured with a screw, and the inner attaches to the moving part with a 'trunnion' that fits in a hole on the end of the lever. This 'trunnion' is also used at the other end of both cables i.e. at the air flap and the heat valve. I have seen two types of cable - a spiral-wound outer (both like this on my 73 roadster), and a later type with plastic outer sheath with embedded longitudinal wires (on the heat control of my V8, the earlier type on the air control). Both types for the heat control use a solid wire inner, but the spiral outer type for the air control both use stranded cable. This is rather odd as both work on a push/pull principle i.e. it has to be pushed one way and pulled the other, it is not like the accelerator cable which the pedal pulls but returns under the action of springs on the carb. I believe the later type of outer came about because with the earlier spiral-wound outer if the other end is stiff then pushing on the wire just causes the spirals to open up like a spring instead of moving the valve or air flap, which was what was happening with the water valve on the roadster when fully shut. The later sheath does not do this and so you can get greater force on the inner when pushing. But although My V8 has this later sheath and was not expanding when the control was pushing on the wire, the valve was so stiff that when it pulled on the wire it was pulling the sheath through the clamp, which required some ingenuity to fix (see below). Note that there are different control mechanisms installed to the dash for heat and air direction, so if you remove both remember to label them or check the 'logic' of them before going to the bother of reconnecting the cables and installing them. Chrome bumper cars have both controls of the same design i.e. sheath and inner clamps in the same basic positions, albeit at slightly different angles to the spindle. Unfortunately this give rise to the illogical heat control where you have to turn it clockwise for heat, whereas you turn the air control anti-clockwise for air, which is the more logical direction (think of most sink/basin taps). This is because the heat valve works the other way round to the air flap i.e. it has to be pushed for heat, whereas the air flap has to be pulled for air. On rubber bumper cars the heat control has the positions of the sheath and inner clamps reversed, as well as them being at different angles to the spindle, and this gives it the more logical 'anti-clockwise for heat' action. The cable that controls the flap attaches to the right-hand end of the flap, and uses the same kind of trunnion for the inner and curved clamp on the outer as for the heater tap and dash controls, see below. Before the rubber block in 1971/72 it was very difficult to get the heater back into the car with the cable attached without kinking it, and although access through the footwell vents to attach it afterwards is possible it is not easy. With the rubber block and later vent it's impossible to attach the cable afterwards as the out clamp is in a cut-out in the block, but a slot in the bulkhead makes installing the heater with the cable already attached much easier. Originally the cable had a stranded inner in a wound steel outer AHC185 (NLA, said to have been replaced by AHC752 heat control on the MGC), replaced by BHA4337, which only seems to be available from one supplier in America, with a 'steel casing', described as being 37" long which is the length of the heat control cable. In August 71 the air direction cable changed to BHH1229 (again only shown as available from one supplier in America), and in November 72 to BHH1230 (multiple suppliers) to be the same as the new V8, both these having a plastic-covered nylon sheath with four longitudinal reinforcing wires and are 24" long. However Vee built in May 75 has a steel outer with stranded inner cable. A solid inner for air direction would seem to make more sense, but as some of them have to be fitted to the heater unit before it is fitted to the car, and has to be wedged into the bulkhead slot, it's possible a solid inner may kink making it stiff. In any event the flap should move very freely so stranded is not a problem. BHH678 and BHH679 are mentioned by some suppliers, are steel, probably have a solid core, but are intended for the water valve as they are much longer at 117cm/43" and 97cm/38" respectively. Note that some sources interchange the steel and plastic types in images, the lengths may vary, and the inners are not specified. There should be a lever in the left-hand footwell by the right knee of any occupant for both RHD and LHD cars. It opens a large flap behind the console which opens the bottom of the airbox and lets cold air in directly from the air box. It is only effective when the car is moving, not when the fan is on, and even if the heater is going full-blast makes the cabin jolly cold if it is either open or the seal is defective! The lever is said to click the flap into three positions, one of them being closed, but both my 73 roadster and 75 V8 have an extra 'notch' on the lever quadrant giving a third, even wider open position, albeit needing a bigger tug and a longer movement of the lever to get to it. If this flap is open or leaking it will easily defeat the attempts of the heater to warm the cabin on a cold day. There should be a gasket round the edge of the flap to seal to the aperture, this makes the flap close with a 'thunk' rather than a 'clang'. Just spotted this on page 62 of Clausager, which clearly shows the control quadrant having four notches. The flap is closed so the spring catch is in the first notch, there are three more notches giving three open positions. It also seems to show the 2nd open position having a bigger notch than the others, which means it would take more of a pull on the handle to move it from that one to the final one, which is exactly how mine is. Herb Adler has sent me this photo of a mod he has made to the detent to make it easier to move the flap. It consists of a coil spring on the bolt, which is easier to compress and allows the whole detent to move downwards, rather than having to spring the actual detent itself between notches. I suspect the spring that carries the roller is slotted so that it can be adjusted such that as the roller drops into the 'closed' notch it can pull the flap against the aperture to give a good seal. There are vanes on the back of the cold air flap to direct air into the footwells. Coolant Return Pipe Added July 2009. Ever wondered what that kink in the coolant return pipe was for? Oil filler cap? Nope. To allow a smoother route for MkII accelerator cables? Nope. To clear the PCV valve on Mk1s? Nope. Reused a part for another model? Nope. Drawing office hiccup? Nope. Give up? Chris Betson wins the prize. The heater controls have been described as 'wonderfully illogical' in the past, and this is because with the chrome bumper controls you have to turn the air direction control anti-clockwise to turn it on which is fine, but the heat control has to be turned clockwise. Not only is that illogical from a tap point of view, which normally has to be turned anti-clockwise to turn it on, but doubly so as it is also the reverse to the air direction control. However this only seems to have been for 4-cylinder cars that used BHA4326, according to the Parts Catalogue CB V8s used BHA4334 with the more logical arrangement. Rubber bumper cars had knobs of a different style, and on these the heat control direction has been reversed to make it the same as the air direction control i.e. anti-clockwise to turn then both on. Up to the 77 model year they used BHH1687, and from the 77 year on the knobs changed again to a coloured and illuminated style positioned on the centre console. These had a common knob BHH1866, with separate surrounds for heat (BHH1870) and air (BHH1873). August 2018: The CB heat (both 4-cylinder and V8) and air controls are available, as are the illuminated controls for the 77 and later console installation, but not the earlier RB controls. Two aspects to the heat control valve - adjustment of the cable operating it and coolant flow through it. I'll cover the cable first, or you can skip straight to coolant flow. The heat control, unlike the air flow control, uses a cable with a solid inner to operate a lever on the valve. Even if the valve operates smoothly and easily there is lost motion in the control, cable and valve, but the control and valve both seem to have the same amount of movement on the levers. Therefore you can adjust the cable so that at one extremity the valve is fully shut, or adjust it so that at the other extremity the valve is fully open. You cannot adjust things so that the control will move the valve from fully open to fully shut, so which one do you opt for? I suggest that unless you have an additional on/off tap to shut things off completely in the summer you go for the 'fully off' option. In any case in the UK at least you are quite likely to sometimes want the heat on in summer, and sometimes want it off in winter! Even not being able to fully open the valve on either of my cars I still get air temps of around 140F/60C coming out the heater and that is with an ambient of about 50F/10C which I find quite adequate and usually have to turn down after a while. As well as the heat control being constructed differently between chrome bumper and rubber bumper they are positioned differently in the dash. From 77-on the heater controls were fitted in the centre console, which makes removing and refitting the console more of a challenge than normal. John Maguire in Australia also found the standard cable routing was a bit tortuous resulting in stiff controls, and has made some changes as shown here. For the 1972 model year two fresh-air vents were fitted to the centre of the dash controllable for both air volume and direction. Rather pointless in the roadster except perhaps in a tropical rainstorm, but they do make the GT more comfortable. The air for these comes straight from the external air box bypassing the matrix so the air is not heated. Like the cold air flap if you have these fresh-air vents open at the same time as the heater is on you will find the cold air from the vents wins easily. 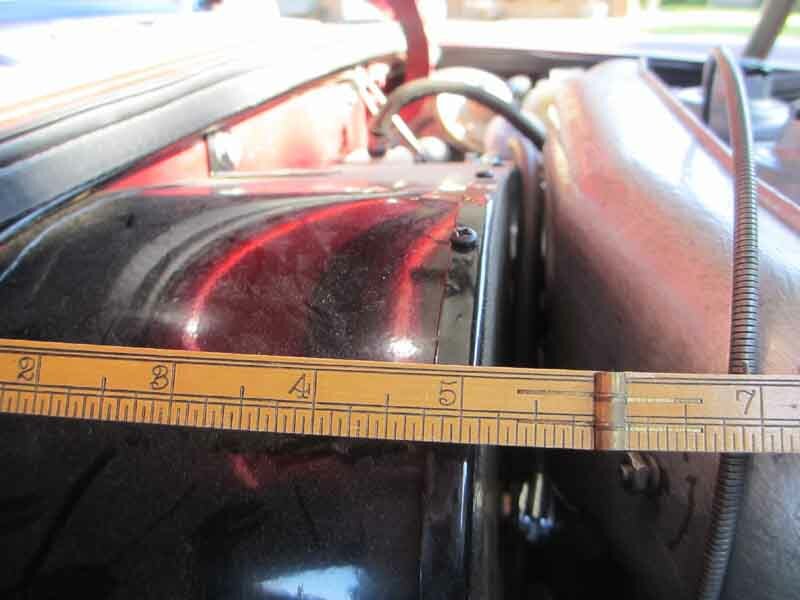 Ray Longsheds writes asking if I had any knowledge of a packing piece between the two dash vents, which is described as an 'anti-rattle' measure in the Workshop Manual. His weren't rattling, but one of them tends to work its way out of the dash and he wondered if the packing would prevent it. I've not found any packing as shown in the manual in either of my cars, but the V8 does have some thin strips of card glued to the back of the flange on three sides. I can see they would make the locking tabs a tighter fit against the back of the dash panel, and so have the same effect. Any packing between the vents would need to total at least 8mm i.e. 4mm each side to protrude past the flanges, but whether that would also prevent them coming loose as well as rattling remains to be seen. Ray replicated what I have and reports that it has worked a treat. All models have a 'warm air' vent in each footwell on the side of where the heater box is located, above the tunnel and behind the dash or console. Originally the vent had an adjustable flap, possibly to direct more air to the drivers footwell if the passengers seat were unoccupied (or you didn't like them). I don't think it was anything to do with directing air to the screen demisters as these cars had the air direction control knob anyway. In August 1970 (Car No. 219001) these adjustable doors were replaced by a fixed hood. Said by Clausager to be 'improved', it possibly did so by having sides and so directing more air downwards onto the feet instead of 'leaking' away from the sides of the flap, but I'm sure there was an element of cost-reduction as well! Removal of the heater unit and especially refitting is frequently said to be one of those 'worst jobs' on an MGB. At some point (probably the 1972 model year) a rubber block was installed between the heater casing and the bulkhead around the demister outlets, and when this decomposes it can 'glue' itself to both surfaces. New ones are even worse, most people find them too thick to go in and too hard to compress, so resort to exotic lubricants and shaving a layer off. But a really promising trick comes from Robert Allan of Linlithgow who said "A car body specialist near me puts the rubber block in a wood working vice and clamps it as hard as possible for an hour or so before fitting, he says this does the job nicely, no need to shave anything off.". See also this description of the complete job from Chicagoland MG Club. However I question the later comment on the above web site about a slot for the air direction control cable. This quotes Haynes as indicating that 1977 models gained a dedicated slot for the cable, replacing the earlier 'egg-shaped' arrangement that encompassed both the right-hand demister vent and the cable. The early arrangement makes it impossible for the heater to be fitted with the cable attached without severely kinking it, which means the cable has to be fitted afterwards - bad enough with the original demister tube arrangement and footwell vent, worse with the smaller fixed vents from 1970, much worse with the rubber block in 1972. The dedicated slot makes it possible to fit the heater with the cable already attached, but it was definitely provided much earlier than 1977. My 73 roadster and 75 V8 have it, as does a chrome bumper shell that could be as early as 1971, all pictured by clicking the thumbnail to the left. Personally I feel it was changed sometime from the footwell vent changing in 1970, or when changes were made to the ducts in 1971, or with the provision of the rubber block in 1972 at the very latest. February 2017: I removed Vee's heater along with the rest of the stuff on the bulkhead as part of a restoration. I pondered long and hard over this, as there is such a lot to remove. The decision was finally made after checking all the pedal box, servo and heater fasteners could be reached and removed, then doing a test-lever under the flange of the heater. It started moving straight away, then suddenly came free with a sound of something coming unstuck, so I decided to go for it. Removed the washer bottle cradle, pedal box and servo first, then removed the clips on the demister tubes and pulled the tubes back into the cabin, and disconnected the air-direction cable from the dash control. After that I found I could just lift it by hand, tilting it forwards to clear the surround, and out it came! Two distinct processes depending on whether you have the earlier bulkhead with the egg-shaped hole, or the later with the separate tall slot. The later arrangement allows the heater unit to be refitted with the cable already attached. But if you have the earlier then you can't get the heater unit back in with the cable attached without significant kinking. If you also have the large adjustable footwell vent, then with that removed you may just have enough room to attach the cable once the heater unit has been refitted. But it's probably much easier to cut a slot from the side of the egg-shaped hole up to where the top of the later separate slot was, and fit the heater unit with the cable already attached. Vee's rubber block is a bit manky, originally I thought it would be good enough to reuse and avoid the problem with the new blocks, but despite care when detaching it for cleaning and painting the case and refitting felt strips to the air-direction section it crumbled quite a bit, so will have to be replaced. The problem with refitting the heater with a new block is two-fold - the thickness of the block increases from bottom to top, and ends up fitting into a recess in the bulkhead. This means that it has to be compressed by a significant and increasing amount as the heater is pushed down, by half it's thickness at the very top, until the thicker part reaches the recess, which is only when the heater has gone all the way down. There may be some scope for shaping that face of the block so it is left full thickness around the demister holes (to ensure a good seal to the pipes) but cutting it back towards the ends and in the middle so less needs to be compressed. That and lubricating both surfaces ... and a couple of bodies pressing it down ... Time will tell. Vee's restoration has progressed to fitting-out the engine-bay. I was able to trim the rear face of the rubber block over most of the thicker part, leaving the area round the vent holes at full thickness, with a craft knife. On fitting as suspected the bottom of the heater was 1/4" forward of the cavity. With an unmodified block you would have to compress the whole of the upper thick part 1/4" to get it in, but trimming as I did meant much less compression was required. Then having lubricated it and the back of the cavity with Swarfega I managed to get the right-hand corner of the heater wedged in, then pressing down (one body) and wiggling got the rest in and all the way down. It certainly helped being able to stand in the engine bay, without that you may have to rig-up some method of standing over the engine. A common problem is water flow through the matrix being reduced due to a build-up of rust 'silt' over many years. This can usually be cleared by repeatedly reverse and forward flushing the matrix until water flows clear. In severe cases you may have to add a flushing compound and leave it to 'soak' before flushing with clean water again. This can be done in-situ with hoses on both flow and return pipes to avoid dowsing the rest of the engine bay in rusty water. If you do get bright orange silt coming out of the heater matrix it might be as well to similarly flush the block (with a cold engine!) and radiator to aid cooling. Updated January 2007 Of course anything that restricts coolant flow in the heater circuit will have the same effect and this includes the metal return pipe running across the top of the rocker cover (thanks David Witham for mentioning this) and hoses as well as the matrix. Similarly the air passages in the matrix could be blocked with leaf litter. Mk2 cars had a mesh over the matrix inlet (not the air-box inlet, which is an aftermarket modification) to reduce the chance of this happening. If the matrix is blocked and compressed air from inside the cabin doesn't improve things removing it and poking the passages clear (trying not to puncture the water passages - test before refitting) or fitting a new matrix. A third possibility is the airflow bypassing the matrix, and hence not passing through it and picking up heat, because the seal around it has decomposed. Ashley Hinton, manufacturer of the heater system components using the original Smiths tooling, supplies a felt seal 17H 1797, rather than the foam seal that all the other suppliers seem to have, as felt stands up to the heat much better. Makes sense. Not much you can do about this seal short of complete removal and dismantling, although it may just be possible to lever the heater cover back with the heater unit in-situ and wedge more in. It's said that by modifying the cover you can remove it with the heater in-situ to access the matrix. Well, you can remove the cover, but you still can't remove the matrix without further modifications to the case. The matrix can corrode through or split, leading to water on the carpet or dropping on the ground from by the air vent drain tube. In the case of the former you may get the sweet smell of antifreeze in the cabin and heavy condensation forming on the screen above the air vents. While conversing with Ray Longsheds about steering wheel replacement he mentioned in passing seals for the matrix ports where they pass through the heater cover. A new one on me as they are not on either of my heaters or listed in my BL Parts Catalogues, and although they are shown by some suppliers for the MGB, some like the MGOC only show them for the MGA. Where they are shown, they are listed as 7H1993. They do finish things off nicely. Motor and Fan Updated October 2006. The heater fan is powered from one of three fused circuits. Up to 1970 it was the green circuit in the fusebox. From 1971 to the end of chrome bumper production it was powered from the accessories position of the ignition switch - a white/green from the switch to an inline fuse under the fusebox, then a green/pink to the fan switch. On rubber bumper cars it reverted to the green circuit in the fusebox again, until the ignition relay circuit on RHD cars was modified sometime in 1978. At this time a second in-line fuse between brown/white and green wires was added under the fusebox, and the heater fan was powered from one of these - the one with the thinner wires, the other with thick wires being for the cooling fan. For more information see the ignition schematics. Until 1977 or so (possibly earlier for North American spec cars) a single-speed fan was fitted, after that a dual-speed system was provided. The diagrams for the latter seem to show a different motor being fitted with 'fast' and 'slow' windings but in fact it is a similar single-speed motor with a dropper resistor to achieve the slower speed. With this system is does not matter if power is applied to both high and low speed switch outputs at the same time. However if upgrading with a motor that has internal arrangements for two speeds, i.e. three connections (the same as the two-speed wiper motor) power must not be connected to both the high and low speed connections at the same time or the motor will be damaged. The dropper resistor is inside the heater box to benefit from the cooling flow of the fan (failure of this component in modern cars seems very common). From the 3-pin connector the two coloured wires go into the heater box and a single wire comes back out to one side of the motor, the black wire going directly from the 3-way connector to the other side of the motor. To check the dropper resistor if the fan only runs at fast speed, measure for resistance between the green/yellow and green/brown wires at the heater plug, unplugged from the harness socket. See Clausager pages 66 and 67 for both types. Early cars (Parts Catalogue indicates Mk1, but Clausager indicates it could have been later) may have had motors (17H 2288) with wound stator and rotor the same as the MGA but after that they had a motor with a permanent magnet stator. The effect of this is that whereas the early motor will always turn in the same direction regardless of polarity (like the starter motor) the later motor is polarity sensitive. If the later motor is connected backwards (or the polarity of positive earth cars is changed and the heater fan isn't reversed as well) the motor will run backwards which will result in a greatly reduced output but an increase in noise. This isn't immediately obvious as air continues to flow in the normal direction, and it was only because I already had the roadster that I noticed how poor the air flow on the V8 was. Reversing the connections resulted in the same air flow as the roadster, and much less noise. The early motor seems to have two white (they were black on the MGA) wires exiting from the same point on the motor connecting to a black and green/brown from the harness via bullet connectors. The later single-speed (37H 4707) has different coloured wires exiting from opposite sides of the motor going to green/brown (before 1970) or green/yellow (70-on) and black harness wires via bullets. The motor changed again in about November 1972 with the introduction of the V8, which needed a 'shorter' motor to clear the carb air box, but was fitted to all models (37H 7913). At the moment I don't know if the motor itself was shorter, or just that the mounting flange was fitted further back, putting more of the motor inside the casing and less outside. The motor changed again in Sep 76 (37H 6102), possibly being a more powerful motor to make the most of having the two-speed switching (half the speed of the original motor for the first speed being pretty useless, much like the dimmer rheostat for gauge lighting ...), for the remainder of production. However note that some suppliers have substituted the earlier 37H 7913 for the one originally used in the two speed heaters, so if the final motor was more powerful, fitting the earlier one will reduce heater output. The two-speed has green/brown, green/yellow and black wires with a 3-pin plug and socket so cannot be reversed. The two coloured wires go into the heater casing, and a third comes out going to one side of the motor, with the black wire going direct to the other side of the motor. Note that from 1971 for the remainder of chrome bumper production and all V8s the heater fan (and wipers and electric washers) were powered from the accessories position of the ignition switch via a white/green to an in-line fuse under the fusebox, and then via a green/pink. This green/pink also fed the wipers, electric screen washers (North America) and radio. Bad connections in the solenoid - brown - ignition switch - white - fusebox - green - fan switch - green/brown or green/yellow - fan - black - earth circuit can contribute to slow running. The motor takes about 3 amps so it doesn't need much extra resistance to reduce performance. Some say fitting a relay will improve fan speed but in my experience if it does to the level claimed then you have bad connections in the circuit and you will do more good by fixing those than fitting a relay. If they are in areas common to other circuits i.e. brown - ignition switch - white - fusebox - green then fixing problems will benefit other circuits as well such as indicators and brake lights. To see how much you are losing connect a voltmeter between the live motor wire and the brown at the fusebox, and again between the earth wire of the fan and a known good earth e.g. the engine. Any voltage you see is being 'lost' and not reaching the motor. To see the effect of fitting a relay, with the fan on (fast if two-speed) connect a heavy gauge wire between the brown at the fusebox and the live (not the earth!) wire at the fan, making sure it is the fast wire for two speed motors and not the slow, to see how much better the fan performs. If you do decide to fit a relay then I hope I don't have to explain why you only need one even for a two-speed system! I generally find I hardly have to use the fan, the ram-effect being more than enough for cabin heating. I do need it for screen clearing, and when first driving off on a cold morning the mist that forms from my breath is rapidly cleared by just a few seconds of directing the air onto the screen and using the fan, even though there is not yet any heat in it. If I get sufficient condensation on the glass to form droplets, like on a very wet, cold day, the fan takes ages to clear it. However cracking the 1/4-light open just a touch will clear it quite quickly when underway and keep it clear, I only have to resort to using a duster if stuck in traffic, and only under those very wet, cold conditions. The motors and other heater parts for MGs and many other cars of the period are made by Ashley Hinton who is a supplier to British Motor Heritage and their approved retailers. There are some interesting videos on the manufacture of the motors here. However whereas the factory used a different motor when the 2-speed arrangement was provided, I understand from Ashley Hinton that they only make one motor. If the factory two-speed system used a more powerful motor to gain benefit at the higher speed, this will be lost with the replacement motor. Originally there were short straight rigid tubes (AHH 6527) passing through the double-skinned bulkhead into the heater unit ports. In the cabin behind the speaker panel two elbows ((14G3499) fitted into an oval panel that screwed to the inner bulkhead, which locates the elbows over the ends of the tubes. At some point (possibly 1971/72) the rigid tubes and elbows were dropped and the flexible tubes seem to be longer and have changed in shape at the heater end and how they attach to the heater - they just push into the rubber block that is now glued to the back of the heater casing. A much simpler and cheaper arrangement - except when you come to remove or replace the heater! The Leyland Parts Catalogue shows two types of flexible tube - one as item number 3 (AHH8394) and one item number 39 (BHH390) which may well indicate one was 'early' and one 'late', but gives no information on a change from one to the other. The dreaded rubber block is part number BHH389 and immediately precedes the later tube both in part and item number, which indicates the block performs the same role as the rigid tubes, and modified flexible tubes push straight into that rather than going via an elbow. The September 76-on Parts Catalogue only shows the block and later type of flexible tube, and no elbow or rigid tube, which does tend to confirm it. Some suppliers give chassis number 258000 as the change point, which was the cross-over from the 71 to the 72 model year, certainly my 73 roadster and 75 GT V8 have the later arrangement. Clausager mentions the provision of fresh-air vents on the dash for 1972 models, but not a change to the screen vents. The Parts Catalogue shows the elbows but not the rigid tubes, suppliers usually list both. Some suppliers say to use the earlier flexible tube AHH8394 in place of the later BHH390, but they may not push into the rubber block as easily or seal as well. February 2019: Some beautiful weather and as the mist had largely cleared one Sunday morning too Vee out. Then the mist came back and turned in to fog so had to abort, but not before the screen started misting up ... which was when I discovered the drivers side wasn't doing anything. Air coming out from somewhere behind the centre-console so the tube was obviously loose where it goes into the heater block, and whilst I could just feel the block behind the bulkhead and the plain section on the end of the tube there wasn't enough room to grasp the tube and push it into position. I felt behind the centre-console and apart from the brackets that it screws through the edges of the panel were further back which would give me more room if I pulled the console back an inch or so. The steering wheel is also in the way of my head when reaching back there, so that comes off first. Removed the gear-lever ring and gaiters (which may not have been needed) and the cubby screw to pull it back a couple of inches, and removed the four console screws and pulled that back. Better but still no good. The trim panel that the hoses go though has a hole that is quite a bit smaller than the hole in the body panel, so remove both demister tube clips, and the single panel screw that happened to be at the bottom on the passenger side (not even a hole on the drivers side), then I could fiddle the trim panel backwards over the hoses. At last just enough room to get a hand in, grasp the pipe and push. Not held terribly firmly, but it resisted a gentle pull, and the tube bracket should hold it in position. Had that failed I'd have to remove the radio chassis from the console and reach through the radio slot, or maybe remove the complete console. Switched on and still no air from the vent. Feeling up behind the dash there was air flowing there as well, but none behind the centre-console, so the vent end of the hose had probably become detached as well. I usually reach up from behind the outer end of the dash over the rev counter to get to anything back there, and whilst I could feel the vent pointing downwards I couldn't reach the bottom where the hose should go. Behind the speedo looks pretty cramped, but I was surprised how easily I could reach the tube and the vent. It went on but again not as securely as I would have liked, but again the tube bracket should hold it. This time success, bags of air from the vent ... and checked the passenger side as well in case I had dislodged that at the back of the heater. Put the tube brackets (which are used to for the electric aerial relay on the drivers side and an earth connection on the other) back and checked both vents again - still good. Put the trim panel back - still good. Then it was just a case of putting everything else back, and even though none of that was anywhere near the tubes checked again. Last thing to go back on was the steering wheel, but I'd forgotten to straighten that before removal so I wasn't quite sure which spline it should go back on without going up and down the drive a couple of times to try and get the steering straight. May still be one spline off, but that's easy to remedy. There are several seals around the heater casing to prevent fumes from the engine bay getting into the cabin. However this does not include the rubber block around the demister vents used on later cars - possibly 71/72 on, as all this does is wedge the heater in to prevent it rattling, and to provide a simple way of connecting the demister tubes to the heater. The first seal is around the intake and is circular. Then there is a strip across the back of the casing level with the mounting flange, and finally three more strips under the flanges themselves. The originals are either rubber or high-density foam, and robust, but the replacements seem to be low-density foam. Finally there is the seal around the matrix, which prevents air bypassing it. Originally low-density foam, ironically (given that the other replacement seals are poorer than the originals) I have seen reference to a felt version from Ashley Hinton which should be an improvement. Did I say finally? While Vee's heater was out as part of a comprehensive restoration Ray Longsheds happened to email asking about removing the steering wheel. And as part of that conversation he just happened to mention some rubber grommets that go round the heater ports where they come out of the cover. Completely new to me as neither Bee nor Vee have them and they aren't shown in the Parts Catalogue. The usual suspects seem to stock them (7H1993), including MGOC, but they only list them for the MGA. Ray felt that they helped to seal engine compartment noise from getting into the cabin via the heating/ventilation system, and once fitted they do finish things off nicely. A lot of anguish has been expended on heater valves saying the originals don't open far enough for maximum heat, and it's true that because of the lost motion in the control and cable you can either set the cable to fully close the valve but only have it 3/4 open, or alternatively set it to fully open but not be able to shut off the heat. However once the valve is 2/3rds open or so it is fully open as far as flow goes! The coolant inlet and outlet are about 0.360" diameter or 0.1 sq in. The main part of the valve is 0.645" or 0.326 sq in, and the cup sitting in it is 0.520" or 0.212 sq in, giving a clearance between the two of 0.114 sq in i.e. slightly more cross-sectional area than the inlet and outlet. There is also the hole in the middle of the cup with the tapered pin at its narrowest portion increasing this area, but it is complicated by whatever lifts up the cup - the spring clip will offer very little restriction, the circlip will close most of it off, but in the worst case it is still adding some flow. Therefore the cup only has to lift off its seat by .070" at the most to give the same cross-sectional area. I have measured the total lift at double that, and the lift starts occurring when the lever is mid-way on the ramp, therefore the lever only has to move about 3/4 the way towards fully open to give maximum flow. Michael Beswick's empirical tests have confirmed this, and also that the lever does not have to be fully towards the closed end of the ramp to fully shut off, further reducing the arc the lever needs to travel to go from zero flow to maximum flow. My own experiences of four valves on two cars also confirms that you have to turn the control from fully open significantly further than half-way towards fully closed before heat output starts reducing. Therefore putting a stack of washers between the cup and spring-clip or circlip to lift it higher is almost certainly a waste of time, as well as destroying the fine control at the lower end by blocking up the hole through the cup for the tapered pin. Using a non-standard valve with an inlet the same size as the cylinder head port will remove that restriction, and a completely different mechanism may well give a larger through-area when fully open, but you will still be restricted by the bore of the outlet port, the OD of which at least must be similar to the standard valve in order to connect to the heater hose. Those people that claim that some cobbled together valve gives more heat, or modifying the standard valve to fully open it, are probably only compensating for some other defect in an old valve - in the former case quite probably because of gunge restricting flow. I was quite surprised by the amount of gunge in my 9 year valve, given that I have always used anti-freeze with a corrosion inhibitor. Bob Muenchausen has done some sterling work on improving his heater valve. However that was on a non-OE valve and my OE valve does seem to be subtly different internally, as I discovered when I had the opportunity to section a failed OE valve from the roadster. What you may think of as just a simple 'tap', is actually quite a sophisticated three-stage system - a fine control, a coarse control, and a shut-off as the pictures (click the thumbnail) show. I had always been curious as to why the roadster valve gave no fine control of heat around the WARM position whereas the V8 does, but after sectioning the old valve I could see that the cup and seat of the coarse-control valve were both heavily corroded which meant it would have been passing coolant even when on its seat and so bypassing the fine-control valve. When testing the new roadster valve it initially seemed no better at fine control than the old, hence still not as good as the V8. But maybe I just didn't wait long enough for the heat output to respond to a movement of the control during testing as later in the year when needing some heat on a run I had no problem in positioning the control to get warm air of the desired temperature, i.e. the new valve does offer fine control just like the V8. Heat Cable: Originally the cable was a solid inner in a wound steel outer, BHH678 (117cm according to Leacy) then BHA4337, then BHH679 (97cm from Leacy, 89cm from eBay). In February 1975 the cables changed to a plastic-covered nylon sheath with four longitudinal reinforcing wires BHA5407 (39"). The only mention of the V8 in the Parts Catalogue is for car 2292 which dates it to shortly after February 1975 with cable BHA5407, however the V8 valve is adjacent to the bulkhead towards the left-hand side so is significantly closer to the dash control than the 4-cylinder. The valve itself was changed in December 1974 at car number 2146. These both pre-date mine which has the plastic sheath with solid inner and I know that is nowhere near 1m long. Note that some sources interchange the steel and plastic types in images, the lengths may vary, and the inners are not specified although a solid is essential for the heat valve. Fitting and adjusting the cable: August 2016 This can be quite a fiddle, but there is a process which I have found makes it easier. Turn the heat control to Off. Remove the outer clamp altogether. Shut the valve fully so the trunnion is in view, and you can poke the end of the inner through the hole in the trunnion very easily. Position the outer about where it will be under the clamp, then tighten the inner. With the valve pushed open, loosely refit the outer clamp and pull the outer through it until the control has been turned towards closed by the desired amount and tighten the outer clamp. You don't need the valve to be turned so far off that the slider is on the flat part of the ramp. Flow is shut off before that, so by closing it too far you are reducing how much the control will open it by. Also if fully closed the cable can have difficulty opening it at all. Update September 2008: Bee's heat control has always been stiff to turn compared to Vee's and just lately seems to have been getting worse, nigh-on impossible to turn, so time to investigate. I disconnected both inner and outer from the valve, and it was almost as stiff as previously, whereas the valve was easy to move. Next I removed the control from the dash (very easy on the UK tin dash) and disconnected that from the cable as well. That was interesting, as not only was the control very stiff, despite a liberal coating of oil and grease, but the cable inner was also quite stiff to push/pull as well! I sprayed some releasing fluid onto the control, both the shaft the knob fits to and the part it turns to move the cable inner, partly to clean off the old grease and partly to see if I could ease it. Working the control back and fore it eased up a lot. Wiped that off then sprayed on some light oil, wiping off the excess, in the hope that keeps it free. Also put some grease on the teeth of the 'rack and pinion' where the rotary movement of the shaft is converted to a back and fore movement of the part the inner attaches to. Next pulled out the cable inner (leaving the outer in-situ). Very sticky to the touch so cleaned that off with releasing fluid as well. I noticed some corrosion on the inner near the engine end, so rubbed at that with fine wet and dry to smooth it off as best I could. Started inserting the inner, daubed a bit of copper-grease on a short length then pushed that in, daubed a bit more and pushed a bit more and so on. Much easier than daubing the whole lot then wrestling with the greasy cable trying to get it back in round the curves. With a bit of pushing, pulling and rotating (the inner clamp from the valve screwed onto the cable aided this) I got it back in. Reattached it to the dash control (but didn't refit it to the dash yet!) and it now moved very easily. Reattached the cable to the valve, which needs fine adjustment to get it to just fully turn off as the control reaches 'Off', then reattach the control to the dash. 'Like a bit of egg on a shovel' (as my workmates used to say when I was an apprentice digging holes for telegraph poles). July 2016: For some time I'd been conscious that Bee's control was very stiff again, and had to repeat the above process (whereas I've not had to do Vee's in 22 years and it has always been very easy to turn). However this time I used 3-in-1 for lubrication instead of copper grease after WD40 to free it up, which needed two or three applications and turning back and fore until it suddenly came free. Remember the spindle, as well as the large 'gear'. Still problems with Bee's heat control. If I adjust the cable so that it fully closes, then it won't open it again even when the dashboard control is fully open, it just expands the spiral-wound outer (plastic/nylon outers don't suffer from that problem, but have others). If I adjust it such that it will open again, it stops short of closing fully so you can't turn the heat off in summer, and this was the same after replacing the valve. You can close the air direction flap, but then don't get cool air onto your feet. You can open the cold-air flap, but that only cools your knees. I did manage to get round it to some extent by stretching out the last 2 or 3 turns of the spiral outer to act as a short and very stiff push-off spring. That was just about OK, but needed the dash control to be fully opened before it would ping the valve open, and since removing and lubricating the dash control and cable in September 2008 I hadn't been able to get it right again. Some time ago I had the idea of putting a spring over the inner so it would be compressed by the moving lever as it closed, which would assist the inner pushing the tap open as the control was opened, and bought a pack of assorted springs. While the tweak to the outer worked I left things as they were, but now it was time to try the springs. I selected one with the longest free length, that would fully compress with the valve fully closed. Fitted it on, adjusted the outer and inner so the valve was just fully closed with the dash control in the Off position, then found the valve opened when the dash control was only about 1/4 open - result! Too long a spring won't compress enough to close the tap fully, too strong a spring would make it very difficult to close, and probably push it back open again! I've had the opposite problem on the V8 with the plastic-covered nylon outer. That has longitudinal steel wire strands which prevent it expanding when pushing the inner, but because the outer is plastic and nylon it can't be gripped as firmly as the spiral steel and was pushing through the clamp at one end when it was pulling on the inner. I was able to wrap a turn of steel wire around the inner and clamp in such a way as to act as a buffer for the outer, but then the other end started doing it so I had to do that end as well. The bolts can be a pain, as they are partially shrouded by the casting and the diaphragm. When I first changed the valve, probably from the original or at least OEM, I could use my 7/16" ring-spanner on both the top and the bottom when removing the old valve, but on fitting the new one it wouldn't go on as the edge of the ring fouled the casting. I can use the open end on the top bolt, and once slackened a 1/4" socket and extension removes it, but for the lower bolt I had to grind a little off one side of the ring to fit, and that now fits both upper and lower bolts. Once slackened two finger-tips on hands round the valve are used to remove them. I'd noticed what looked like an anti-freeze stain down the side of the block by No.3 cylinder, sometimes wet sometimes dry. It seemed to be coming from the head gasket, but further investigation showed it was from the heater valve gasket, running down the short distance to the gasket, then along the lip of that a little way until the shape of the gasket allowed it to run down the block. Initially it was barely weeping, and certainly I could go many hundreds of miles before I had to add coolant to the radiator, but it was getting worse. The valve and gasket were replaced in 2002 when the valve started leaking slightly on a trip to Ireland so they weren't very old. I decided to cut a new gasket out of some thick gasket card I had, which was thicker than the correct item, so cut one to fit the old valve hoping to whip the old one out and the new one in before I lost too much coolant. I'd also decided to - unusually for me - use silicone sealant rather than the Hermetite Red I normally use hoping it would give a better seal. Undid the bolts and pulled the valve back (hose and cable still attached) and was standing by with a wooden plug cut to fit the hole in the valve, thinking that in the head would be about the same size. I was surprised to discover it is about double the size (click on the thumbnail). The effect of this is that the area for clamping the gasket and getting a good seal is very much reduced, as there is very little width between the edge of the hole for the water passage and that for the bolts. I also found traces of blue silicone sealant on the old gasket so I had used that last time anyway. I'd prepared my new gasket with a bead of silicone on both sides, offered it up, but found it was too far in from the edge to seal to the head, and in any case the coolant running out of the head simply washed it off. In the end I had to let it finish running out, then soak out a bit more with a cloth so I could dry the surfaces. I dried off the new gasket and put another bead of silicone round both faces, this time much closer to the outer edge, and smoothed it round with a finger-tip so not only did it stick to the gasket but also made a wider track, but thin. I've seen the effect of great wodges of silicone - it gets compressed down and most of it squeezes out sideways. Unsightly on the outside, but on the inside it gets into the passages and that through the valve is only narrow anyway and could get blocked. I let it 'dry' like this for about half an hour, then fitted it and the valve to the now dry head. Tightened up, and there is only a tiny bead of silicone all the way round both faces of the gasket, so hopefully only a similar tiny amount on the inside. Added some coolant - but not the full amount that had leaked out in case I had to remove it again, and in any case the level in the radiator was still higher than the head port, even though the heater valve was open. Ran the engine to warm it up and all was well, then blanked off the front of the radiator to get the temperature up higher than normal, and still all is well. Switched off, let it cool down a bit, removed the radiator cap, and there was some gurgling and now the level dropped to just about the tops of the tubes. Let it cool right down before refilling the radiator, I shall run it up a couple more times before our next trip (this weekend!) and top up as required which should be enough to purge all the air, but I'll be carrying a spare couple of litres as normal. 480 miles later no topups needed, and so far no leaks either. The heater port in the head was made larger on engines at the start of the 1972 model year. This significantly reduces the surface area clamping the gasket. Went to get Bee out of the remote garage one beautiful Sunday morning to find a large dark stain under the engine. Oil, brake and clutch fluids all OK but coolant well down, and a drip under the heat valve. Not best pleased as it was replaced 'only' nine years ago. Distributor cap well damp as it had probably been dripping for a week since the last run out so wouldn't start, and drying it as best I could there and then made no difference so I was unable to bring her back to the house. The silver lining in that cloud was that the weather stayed glorious for the rest of the week so I was using Vee every day, which I wouldn't have been able to do had I swapped the cars over at the time. Instead I brought the cap and leads back for a proper clean and dry awaiting ordering and receipt of the replacement valve. This arrived Thursday, so that night I swapped the cars over ready to work on the valve Friday morning on a rare day off at the moment. Low coolant level didn't bother me as it is only a few hundred yards and minutes from the remote garage to home. Disconnect the control cable and loosen the hose, and the old valve and gaskets were off in a few minutes. The removed valve shows slight corrosion, nothing like that on the valve I removed in 2002, which made that almost certainly the original and hence getting on for 30 years old, or nearly so. Whilst nine years life of my first replacement doesn't seem too bad, current moans at the moment are that replacements nowadays only last a couple of years, we shall see. I bought the replacement from Brown & Gammons as it was only £1 dearer than the 'reproduction' from the MGOC. One difference between the old and the new is that the old has a circlip on the bottom of the tapered pin, whereas the new has a wire clip. I don't know what the original had as it had completely corroded away! The circlip would probably tend to block the hole in the centre of the cup when the tapered pin is fully withdrawn, just before the cup is lifted of its seat for full flow. Before fitting I noticed that the lever fouled the pop-rivet joining the two halves of the body, partly because the rivet was sitting a bit high and partly because the gap in the 'U' shape of the lever was wider than it needs to be. A quick crimp with a pair of pliers soon resolved that. No gasket with the new valve which is ridiculous, but I have some gasket card so made my own in a few minutes. Used Hermetite Red again, wondered why the old gasket had blue silicone as I don't normally touch that stuff, until I reread my August 2008 post! Bolted the new valve to the head, fitted the hose, then time to fiddle with the control cable. Switch the cabin control to 'off' reducing how much inner is protruding from the outer, straighten the end of the inner (if required) so that when slid through the outer clamp the end of the inner slots cleanly between the arms of the 'U' lever without jamming in the trunnion hole. Put the trunnion in the hole in the lever and orientate it so the hole in the right place, fit the spring over the end of the cable, then slide the cable through its clamp while feeding the inner through the hole in the trunnion. The natural position for the lever is half open/closed, so with the outer pushed in just far enough to poke a small amount of inner through the trunnion, tighten the trunnion screw onto the inner. Then pull the outer through its clamp until the valve is closed (remember the control is in the 'off' position), and tighten the outer clamp screw. Turn the control to fully open and check the valve has opened (I have had to fit push-off springs to mine) and closes enough when turned to off, and I hit it first time. The car was in the garage flat and level, so with the heater control fully open I poured a 33% anti-freeze solution in to cover the radiator tubes, and started the engine with the cap off. As it warmed up the coolant level started rising so I refitted the cap, but the heater return pipe and the vents remained cool, so I moved the car onto the drive into a slight nose-up attitude and the heater started blowing hot. Once up to temperature I switched off and allowed it to cool until the temp gauge was almost at 'C', removed the cap, and again the coolant level was below the top of the tubes, so added more coolant. It was only just below, so I added enough to get it about half-way to the bottom of the filler neck. A couple more heat-cool cycles should be enough to get it stable. Since refitting the head in January 2018 following conversion to unleaded the lower bolt thread seems to have stripped in that it tightens so far then goes a bit slack. So with sealant I stopped just short of it going slack, but I think there is the occasional drip (along with one from the new water pump!). So if (when, more like, for yet another replacement!) the valve has to come off again I'm going to have to look at helicoiling it. Herb Adler's alternative heater valve. One of the simplest and cheapest 'enhancements' for 1972 and later models is to fit a cover to the external air intake at the bottom of the screen. With this fitted, and the fresh-air vents on the dashboard open and the fan running, the heater works in 'recirculatory' mode, taking air out through the fresh air vents into the external airbox, then back in through the matrix and the fan. As it is taking hopefully warmer air from inside the cabin and pushing that through the matrix, rather than bringing freezing cold air from outside, it should result in a warmer cabin in very low temperatures. But note that the fan has to be running and the fresh air vents open to get any air flow, there is no 'ram effect' pushing air into the cabin as you drive along. Uprated fan blade assemblies appeared many years ago, most notably from Costello with a smaller number of larger blades than the standard fan, which can been likened to a hamster wheel (both in appearance and performance, some say). I don't know whether the Costello item is still available but the MGOC and Moss sell what are claimed to be improved versions. The pictures look just like the originals but apparently they are slightly larger diameter with slightly more blades. One opinion blithely hopes that this will result in more air movement for a given motor speed but a bigger fan would add more load which would slow the motor down, so you don't get as much extra output as you might expect. MGOC and Moss also offer uprated motors which hopefully would at least counteract the slowing-down effect of the bigger fan. The MGOC and Moss offer uprated matrixes (matrixii? ), Moss claims the standard matrix has a 1kW output and its uprated unit is 4.5kW. Currently (November 2014) the MGOC are supplying a 2-speed motor as part of an upgrade kit, which could be used with a single speed heater unit as it doesn't need the dropper resistor of the original 2-speed system. However they tell me that the 'fast' speed is much the same as the original single speed, the extra throughput comes from the bigger fan, which requires the heater to be removed and dismantled to fit. A missed opportunity, as given that the two-speed wiper motors are significantly faster at the higher speed than the single-speed wiper motors, the same principle could have been applied to the fan motor. In the past someone claims to have fitted the MGOC uprated motor, fan and matrix, couldn't see any difference, and wouldn't do it again. YMMV, or Caveat Emptor. November 2018: Someone on the MGOC forum has reported that an uprated (albeit under the original part number 37H7914) matrix from Ashley Hinton has started leaking about a year after fitting. Without seeing it or even any pictures the manufacturer says it is because he used the 'wrong antifreeze or mix'. Hmmm. Terry Brown has contacted me regarding a difficulty he was having with his V8 in removing the airbox from his carbs. Now this might seem nothing to do with the heater, but in fact he has an enhanced heater which is a couple of inches deeper front to back than the standard unit, which brings it very close indeed to the back of the airbox. This unit is manufactured for all MGBs by Clayton Classics and contains what they describe as a "copper and aluminium element with strong heat transfer capability ... coupled with the installation of a centrifugal compact blower". With what looks like four wires leading into the unit, it probably has at least two speeds if not three, but this isn't mentioned by Claytons. Interestingly the cover has a sticker reading "THIS PRODUCT IS FITTED WITH THERMAL OVERLOAD PROTECTION ...", which probably relates to the typical resistor pack that is used to give multiple speeds. These packs have been known to burst into flames in some cars, most notably the Vauxhall Zafira in recent weeks, leading to not one but two recalls. Note that this enhanced heater means the V8 crankcase breather filter has to be positioned elsewhere. Radiator Blanking: Many claim that blanking off the radiator improves heat output in cold weather, but in very low temperatures the thermostat may not open at all so the radiator will be cold anyway. As well as air blowing through a hot radiator, engines are also cooled to some extent by air blowing over the surface of the block and sump, and in very low temperatures it is this that can prevent the engine getting up to normal running temperature and so cause low heat output. If you have the heat on full and the fan blowing in an attempt to get some heat into the cabin this will reduce engine temperatures still further as the heater acts just like a radiator, of course (Note: In very hot weather this can act as a useful additional cooling system - if you can stand the extra heat in the cabin!). 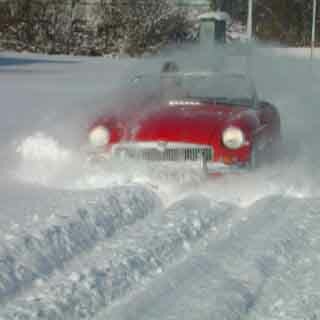 Because the radiator is shrouded in the MGB and most of the air flowing round the engine has already come through the radiator, blanking off the radiator does cut down this flow and hence its cooling effect dramatically, allowing the engine to get up to normal running temperatures and the heater to normal output. You shouldn't have to block off the rad for ambients down to freezing or even slightly below, but may have to if many degrees below. If your temp gauge is way down in not quite freezing weather your thermostat may be the cause. Don't block off too much or you will cause overheating, particularly when in traffic. And don't use aluminium foil as was popular in the 70s as this shreds into tiny pieces and blocks your air filters, as can cardboard when it gets soggy. When I was a lad I can remember an uncle having a radiator blind he could control with a pull-cord from inside the car, starting off with it raised then dropping it as the temperature reached normal. Blocking off the oil-cooler in winter may give some benefit, it's rarely needed in the UK even in a typical summer. Some fit a thermostatic valve to bypass the cooler, but I would be concerned that the valve would be open so infrequently, and hence oil not circulating through the cooler, that the cooler could silt-up. It's also something else to go wrong and leak, restrict oil flow, etc.